much love, illy: julie andrews said it best. 3. Bruno Mars and his song It Will Rain on mega repeat. 5. glitter nailpolish, a holiday must. and last but not least, who doesn't looouuuurve weekends?! p.s. oh and don't forget to enter the Jac and Elsie giveaway! it's stellar! Love the blazer! It's so cute! Also, the sound of music is one of my favorite movies! Any recommendations for glitter nail polish?? I've been looking for some! What cute shoes! Love them with the cuffed jeans. cutie! love your blazer mucho! you look so stylish! Bruno Mars ANYTHING makes me happy! Oh my goodness I need that jacket in my closet ASAP! LOVE IT! Yes...I love blazers myself...I'm partial to short ones like yours...with a longer shirt peeking out. I assume that you do this photo style shoot everyday? I love it...I'd do that to...but hate pix of myself. Where do you get your clothes. Are they all yours? Me again...by the way...I hope you already wrote Santa...I just posted my wish list today....Guess what or who I have on my list. If you snooze you lose. 3 comments for a quarter. You've inspired me. 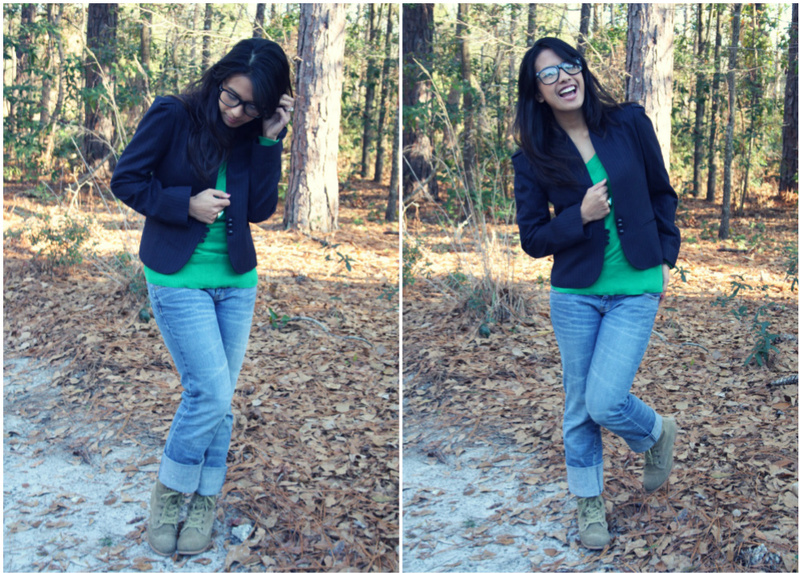 I'm going to do a fashion post with my thrift store jacket and my husbands jeans. Can I do an artistic shot....maybe where my head doesn't show? Your blazer is awesome. And how gorgeous are your glasses! I can't wear those but I wish I could. You look so lovely, dear! Love your blog! I love how you wore those shoes! I have a pair like that and need to see ways to wear them. Thank you! Happy weekend! what a cute outfits! The glasses are adorable! You look adorable!! I love your blazers and those fantastic shoes!! Weekends are truly the best. I love that blazer!! And I have been downing hot chocolate like nobody's business!! :) I love A Christmas Story!! A holiday classic for sure!! Nerd glasses are just awesome. Illy, you look so cute in a blazer, you could start a blazer revolution. xD It would be awesome! 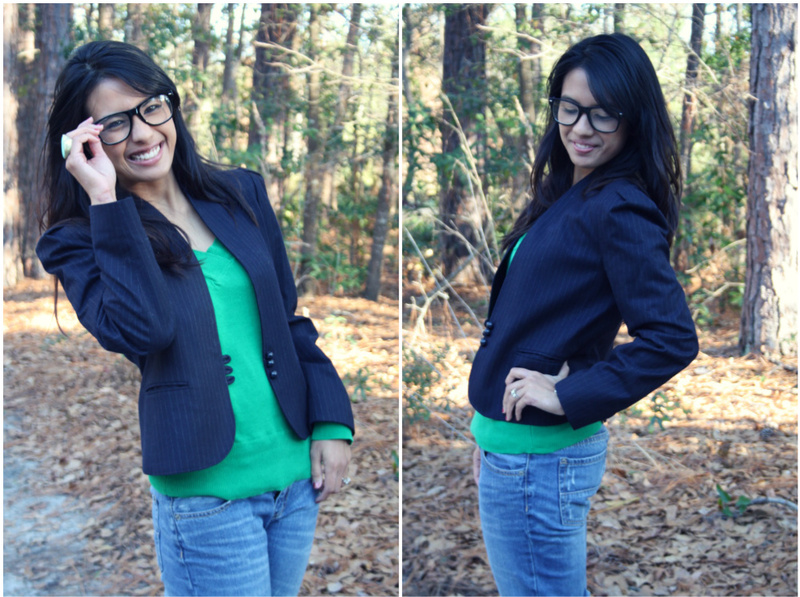 Oh i need a navy blazer so bad!! Yours is adorb!! I LOVE this look. It's like the perfect balance of casual and dressy. The blazer was the perfect addition. Adore. because of this post i started playing bruno mars on repeat. thank you! i just loooooooobe glasses on you!!! Your outfit posts make me so happy. You look adorable in green and I just love those shoes! My coworkers and I were having a huge debate just this morning over Christmas ecards vs. snail mail Christmas cards. I think ecards are a cop out while my coworker says ecards are more green. I'm sorry but ecards are an easy way out and sort of impersonal. I still like the idea of snail mail cards.